Bernie and Hillary went at it in February dissecting progressivism during the debate. But what about the word needs clarification? Even Charles Darwin knew that progress (AKA evolution) is about the deepening and strengthening of moral and social instincts and ethical sentiments and actions. "Any animal whatever, endowed with well-marked social instincts ... would inevitably acquire a moral sense or conscience, as soon as its intellectual powers had become as well, or nearly as well developed, as in man," he wrote in 1871 in the Descent of Man. "For, firstly, the social instincts lead an animal to take pleasure in the society of its fellows, to feel a certain amount of sympathy with them, and to perform various services for them." And yet even a cursory examination of campaign issues and the current battle against liberali... excuse me, progressivism, shows that the development of "intellectual powers" is far from sufficient for instilling a moral compass in man, let alone marking his evolution with "sympathy" and a desire for service to others. Adult members of a wolf pack hunt and feed the cubs and take care of the infirm and injured. Killer Whales feed and protect disabled pod members. Adolescent Orcas babysit, giving mother Orcas social time with friends. Even baboons -- notoriously aggressive and competitive primates -- relinquish much of their competitive behavior if there is a consistent and stable food source available. And yet parties within our government want to slash elderly medical benefits, gut social security, and castrate women's rights while chopping food programs for disadvantaged children... all the while boosting tax advantages and benefits for fabulously wealthy CEOs. If we have the smarts and yet remain so morally crippled we have no compassion for the weak and the elderly something MUST be wrong. Right? Animals don't have to be told that part of the responsibility of being a dog or a whale is taking care of members of their family. They just do it. 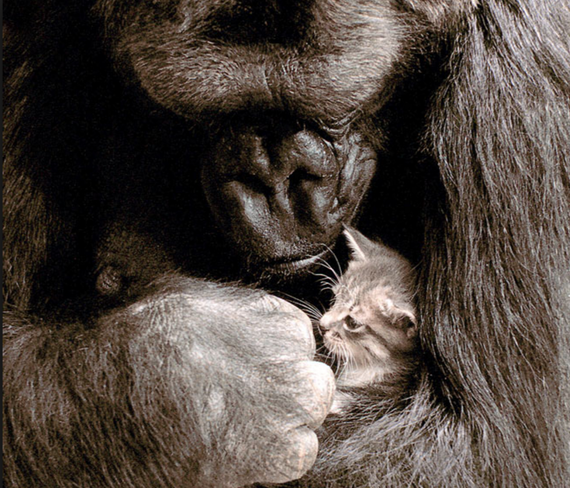 And as Koko the gorilla demonstrated, it doesn't even have to be a member of their own species. So -- what is standing in the way of human compassion? Personally, my vote goes to THE EGO. Animals don't have this false mental construct. The human being, however, has an "image of self" s/he cultivates and believes must be upheld at all costs. And this image of self often precludes kindness and compassion and concern for others. How else do we explain the fact that, unlike animals, humans can glut and satiate themselves, fill massive houses and garages and storage units with STUFF, own stock portfolios and yachts and yet still desire to crush and humiliate the other guy? What else explains the mantra "he who dies with the most toys wins"? We don't need the "most toys" to live comfortably, happily, sanely, and productively. We just need enough. It can NEVER have enough. Why? Because the ego isn't actually real. It's a mental construct. A derivative idea in our heads about who we think we are that arises from physical sensory input and brain function -- sensory input that clearly tells us there is "self" and "other than self." And yet quantum physics makes it clear no such boundaries truly exist. Animals certainly seem to know this. So did Chief Sealth when he made the famous statement, "What we do to the Earth we do to ourselves." The universe is a boundless, seething sea of energy. There is no "point particle" -- no tiny pieces of "stuff" forming the foundations of existence. As the famous Austrian theoretical physicist Erwin Schrödinger put it, "What we observe as material bodies and forces are nothing but shapes and variations in the structure of space. Particles are just schaumkommen (appearances)." Reality as we think of it is pure illusion -- a major point a few silly mystics and philosophers throughout history like Buddha, Jesus and Lao Tzu have tried to explain. Which -- if that's truly the case -- makes the EGO doubly illusory... an idea concocted by an illusion less substantial than smoke. And yet in this dream called life on Earth egos can cause each other pain. We can suffer and make others suffer. And yet we can also choose to set our ridiculous egos aside, stop puffing ourselves up trying to "be somebody" by maintaining policies of "strength" and "competition" and choose to be generous and inclusive. 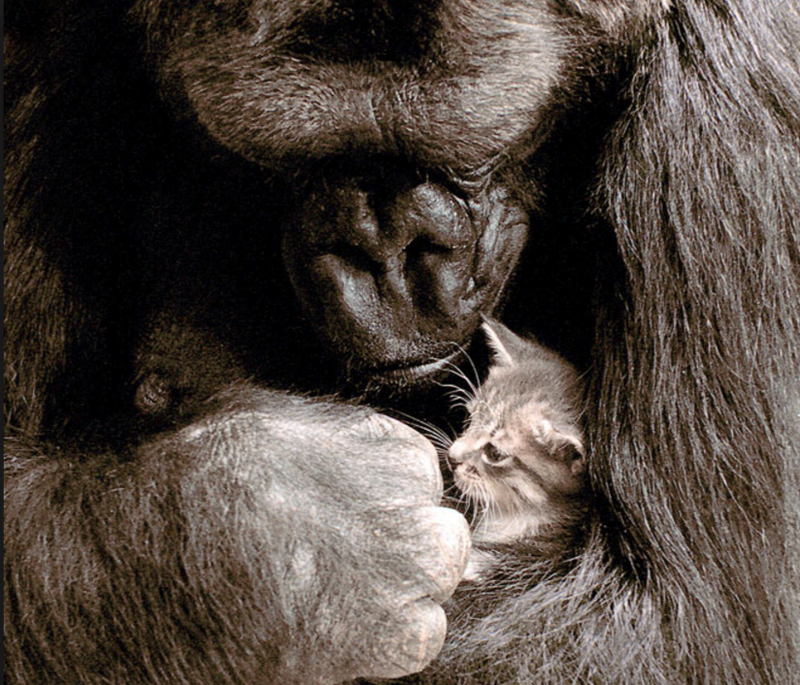 If Koko the gorilla can do it... if our dogs can do it... surely the rest of us -- even conservatives -- can as well.